In this post, I’ll be talking about secrets. Secrets are well secret for a reason. They’re unshared and remain hidden for a number of reasons that can include fear of being ridiculed, scorned, or mocked. In almost everyone’s background, there’s a secret or twenty. Maybe you’re a closet Cheetos eater or maybe you use the bathroom as your me-time space. I just outed two of my secrets. Secrets can be fun and harmless, but sometimes they’re tinged with something more sinister. 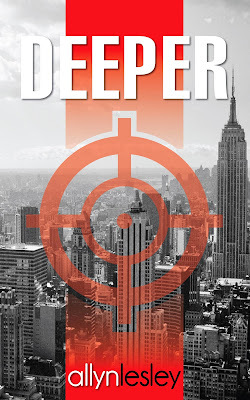 In my debut romantic suspense novel, Deeper, many of the characters have secrets so deep that they could destroy lives. But, aren’t secrets—and their eventual revealing—one of the main reasons we’re all such die hard ‘Just Romance Suspense’ readers? I love a good secret that keeps me guessing and on the edge of my seat. Since I’m into sharing secrets today, here’s another one. Are you ready? Come closer, this one is a doozy. Deeper is now on sale for ONLY $1.99 (sale ends May 10th). Enjoy a never before seen excerpt from Deeper between main characters, Noah Adams and Avianna ‘Avi’ Linton. And don’t forget to enter the giveaway below. Now he knew how evil she was. That calla lily had nothing on her. When he dropped down to a knee, Avi stopped rocking. When one of Noah’s large palms came into her view, she scurried away. Her shoulder blades and the back of her head slammed into the wall. She winced at the pain, but still tried to dodge his seeking hand. The way he whispered her name was like his caresses, comforting and light. The need to escape was real. It prickled her skin. Goose bumps raced on top of her flesh. The tone of his low voice arrested her. Soft, placating, pleading almost. Her heart picked up speed. She couldn’t look his way. For love, some people would do anything—even turn their backs on the only life they've ever known. In Deeper, Noah Adams and Avianna Linton must stand united against the sins of their pasts that threaten to destroy their love and end their lives. I know several secrets but I can't share them. They do have consequences.